It's spreading like a wildfire, affecting every girl that comes it's way. The fear that every girl has experienced once in her lifetime and dreads for the rest. yes, it's none other than the fear of a saree coming off. But there are a few unsung heroes who can handle it with utmost grace and style unlike the rest of us clumsy ones. For the later lot, I have an idea. What's new loves? How you doing? 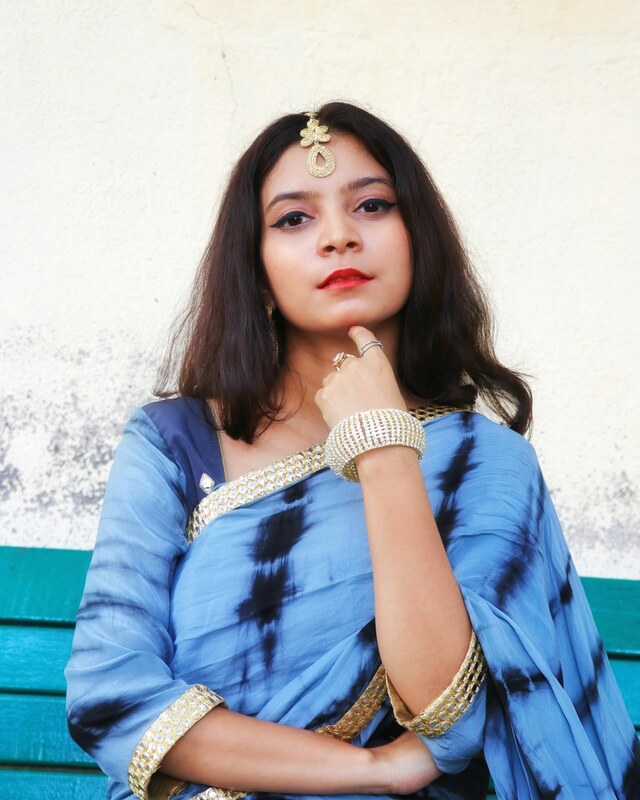 For the times you aren't sure if you'll be able to maange a saree but still wanna wear one, this one's for you! 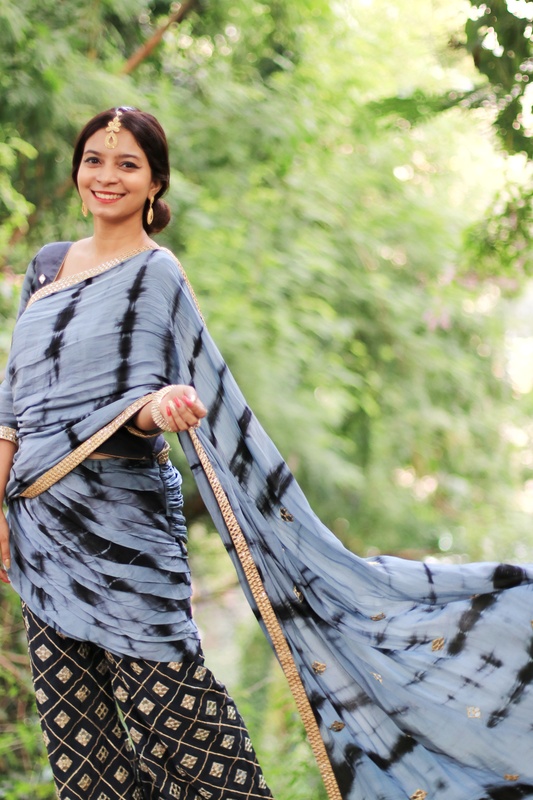 What could be better than a drape that looks like a saree but is as comfortable and free flowing like pants. 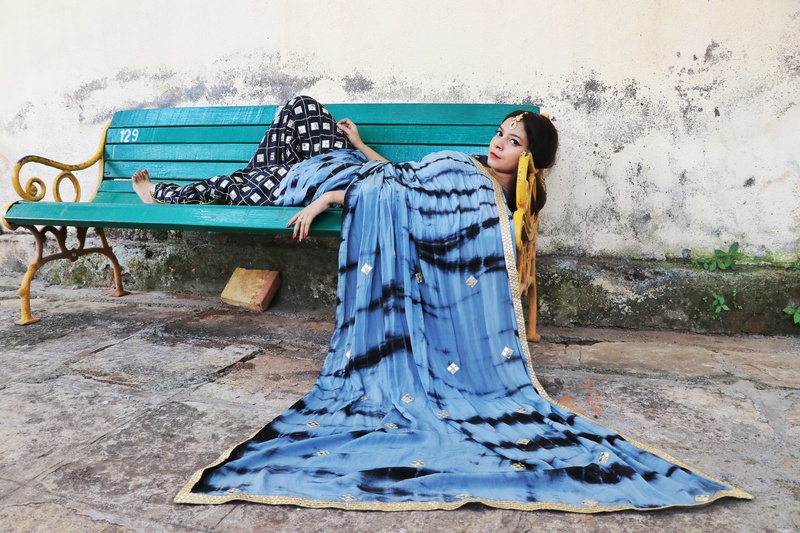 Shilpa kankhara, founder of DHUNI designer studio believes in wearing what you feel, has created an outfit that gives onlookers the illusion of a saree and comfort of pants. From the grey and black pallette with detailing by golden gives the outfit the subtle yet glam look which isn't very loud but can be jazzed up according to your preference. The outfit consists of a long blouse with 3/4th sleeves and golden lace running around the arms and on the corners of the drape, and a flared or kinda bell bottomed pants with golden detailing which has a drape attached to it. The print is very ethinic and traditional but the style is modern and edgy. 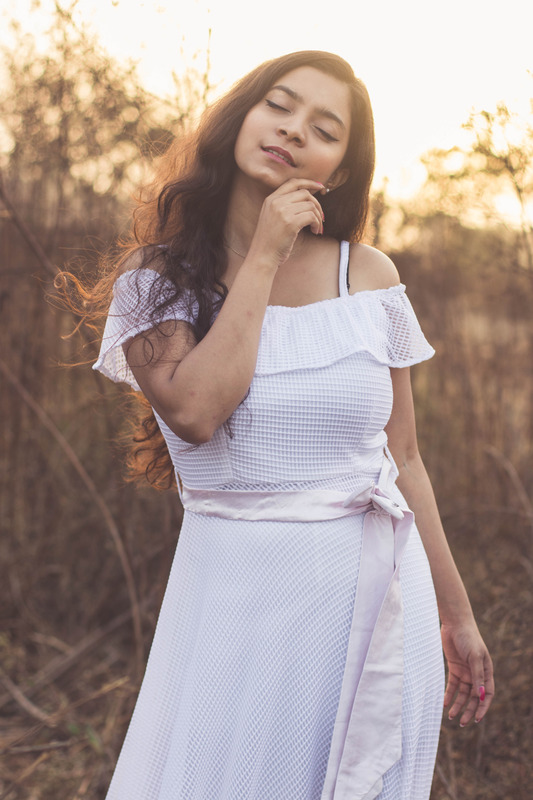 The outfit is easy to style and can be draped in so many different ways, be it a Gujrati style that has pallu in front, or the classic saree style or go a bit out and wrap it up around your neck. 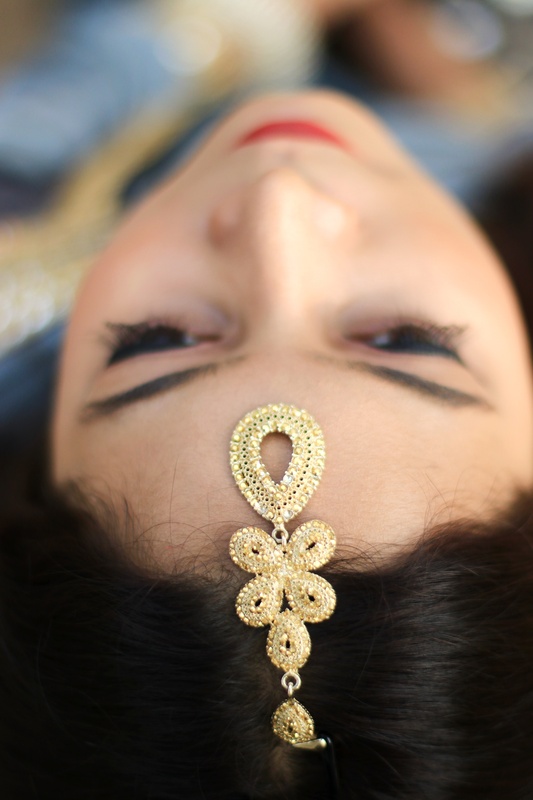 Paired it up with golden jewellery like the mang tika and golden earrings, diamond ring and a kada to go with it. 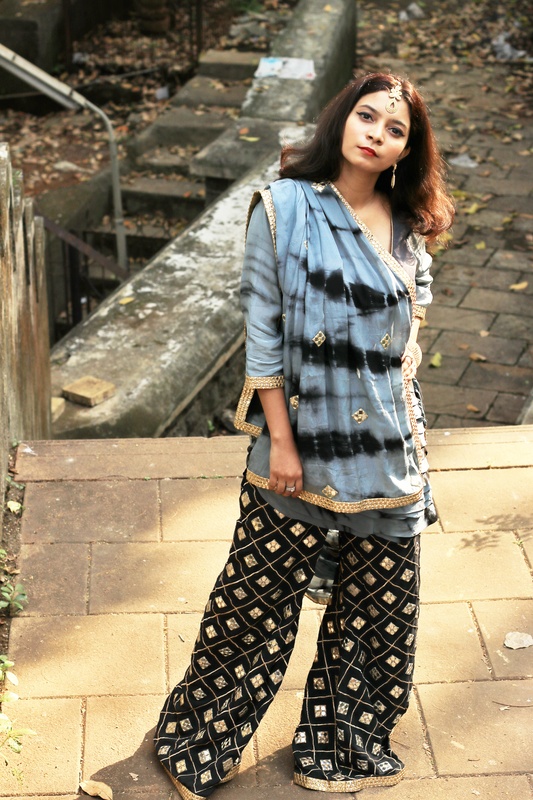 And that's how you stay comfortable, look stylish while keeping the traditions infused in your outfit. So dance all night, run around and do whatever you want without the fear of your saree coming off. Pictures by Haranish Mehta and Vardhan zaveri. Twist the look your way and tag me, Let's spread girl love and inspire each other. Let's come together and make a dope fam"The Bomb Fam" If you are on my space for the first time, Hey there! Scroll down to know more. Also don't forget to click on the follow button on down right of your screen to get the notification everytime I post. Follow me on my social media profiles to get a sneak peek of my life, Instagram/Snapchat/Roposo : the_baybomb. Stay tuned for my next one, till then stay bomb and keep slaying. More hope, love and positivity to you, The Bay Bomb, Sonia Patel.